Currently the Vermont Farms! Association (VF!A) represents about 44 farms and agriculturally oriented enterprises that are open to the public. Membership includes dairy farms, maple sugarhouses, pick-your-own fruit and berry orchards, llama, alpaca and sheep farms, wineries, Christmas tree operations, agriculture museums, dairy-yogurt-cheese-ice cream producers, farm research and education facilities, and other agriculture enterprises that offer farm experiences and farm tours to the public. We represent the diversity of agriculture in Vermont. 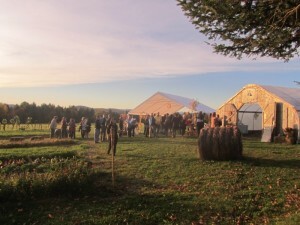 Working farms open to the public provide fun farm experiences and intimate knowledge of actual farm life in Vermont. g. participate in the member association; attend annual meeting and other workshops, engage in mutual referral of visitors. Quality and Performance – Since the major aim of the association is to establish, develop, and promote high standards of agritourism in Vermont, it is essential that quality and performance be of the highest order.